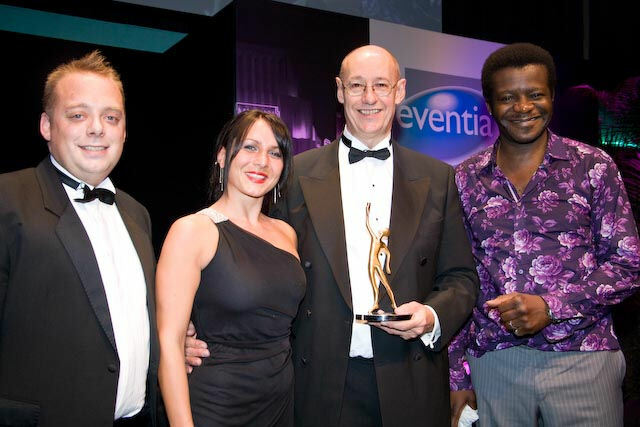 Sponsor John Burgess of Stage Electrics (left), and comedian Stephen K Amos (right) congratulate Tash O’Neil and Nick Blandford of Cornwall Enterprise. In a strange twist, the annual awards event for Cornish businesses has itself scooped a major national award at a gala dinner in London.In front of some 600 events industry leaders, the Cornwall Business Awards won Gold at the prestigious Eventia UK Awards for its “creative use of a small budget”. The honour, spotlighting the best business and consumer events in the UK, came as organiser Cornwall Enterprise was preparing to throw open nominations for the Cornwall Business Awards 2009. From this morning, any business based in Cornwall or the Isles of Scilly is welcome to enter one or more of 13 award categories, which include Young Business Person of the Year, Best New Business in Cornwall and Best Website. The coveted awards will be presented at St Mellion International Hotel, Golf and Country Club on Thursday 14th May 2009, at a high-profile presentation event designed to draw attention to Cornwall’s business community as a hotbed of innovation and quality. Cornwall Enterprise managing director John Berry said: “I am delighted the Cornwall Business Awards has gained this national recognition. It is an outstanding achievement and proves Cornwall can outshine larger, national rivals through our creativity and innovative approach. A full list of the award categories and criteria, and an online entry form, are available now on the awards web site.